WASHINGTON — Geographic and physical challenges — including the Rio Grande and threatened wildlife — will make it difficult to build the “big, beautiful wall” that President Donald Trump has promised on the U.S.-Mexico border, Interior Secretary Ryan Zinke said Wednesday. Throughout the campaign, Trump energized his crowds with his insistence that a wall will be constructed along the border and that Mexico will pay for it. Zinke’s comments, and the administration’s budget proposal seeking billions in U.S. taxpayer dollars to finance the project, offer a reality check and a possible sign the president is moving away from his initial plan. The Department of Homeland Security is responsible for the border wall, but Zinke said the Interior Department will play a critical support role. An internal report prepared for Homeland Security Secretary John Kelly estimated that a wall along the entire border would cost about $21 billion. Congressional Republicans have estimated a more moderate price tag of $12 billion to $15 billion. Kelly told Congress in January that a wall wouldn’t be a complete fix for the border. Zinke’s comments appeared to bolster that view and followed remarks he made Tuesday to the Public Lands Council, a group that represents Western ranchers. Electronic monitors may be more appropriate in that region, Zinke said, while areas with imposing natural features may not require additional reinforcements. The border is already dotted with underground sensors and camera towers, along with about 700 miles of fencing in Texas, New Mexico, Arizona and California, and it’s unclear how much new fencing the Trump administration is proposing. According to new budget details sent to Congress, the administration wants immediate funding to complete an existing barrier in the Rio Grande Valley, $500 million to complete 28 miles of a border levee wall near McAllen, Texas, and $350 million for construction along two segments near San Diego. 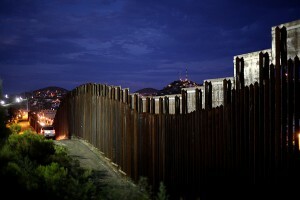 Customs and Border Protection, the Homeland Security agency that will eventually patrol and maintain any new fencing or walls, has asked contractors to submit proposals for a 30-foot-high wall that is difficult to climb or cut through. Bids were originally due to the government by Wednesday, but the deadline was extended to April 4 amid questions from possible bidders. In a pair of contract notices made public two weeks ago, the government said proposals could lay out plans for a solid concrete wall or a structure that can be seen through by border agents. Fencing that is already in place is a mixture of various designs, including towering steel bollards designed to keep both people and vehicles from moving north and shorter steel posts aimed only at blocking cars. In parts of Texas’ Rio Grande Valley, some stretches of fencing are nearly a mile away from the border in part to accommodate flood plains and an international treaty. And in Texas, almost all of the land along the border is privately owned. When former President George W. Bush tried to build border fencing starting in 2006, he faced stiff opposition from local ranchers and farmers, many of whom took the government to court on plans to use their land. Associated Press writers Elliot Spagat in San Diego and Andrew Taylor in Washington contributed to this story.